E. of Ross against Worsop et al. The joint and several Answer of Elizabeth Worsop, otherwise Wood, Widow, Worsop Bush and Noah Webb, Esquires, to the Appeal of Richard Earl of Ross in the Kingdom of Ireland, was brought in. E. of Radnor takes his Seat. This Day John Earl of Radnor sat first in Parliament, after the Death of his Cousin Henry Earl of Radnor; his Lordship having, at the Table, first taken the Oaths, and made and subscribed the Declaration, and also taken and subscribed the Oath of Abjuration, pursuant to the Statutes. Messages from H. C. with Bills. With a Bill, intituled, "An Act for the better securing the Freedom of Parliaments, by limiting the Number of Officers in the House of Commons;" to which they desire the Concurrence of this House. With a Bill, intituled, "An Act to render the Laws more effectual, for preventing the stealing and destroying of Sheep and other Cattle;" to which they desire the Concurrence of this House. Porter et al. to import Spanish Raw Silk, Bill. With a Bill, intituled, "An Act to empower Joseph Porter, James Bourdieu, and Abraham Desmarette, to import a certain Quantity of Raw Silk, of the Growth of Spain, from Leghorn;" to which they desire the Concurrence of this House. With a Bill, intituled, "An Act for naturalizing Martin Kuyck Van Mierop;" to which they desire the Concurrence of this House. The Three last mentioned Bills were all read the First Time. Burnaby to take the Name of Greene, Bill. Hodie 2a vice lecta est Billa, intituled, "An Act for enabling Edward Burnaby, an Infant, and the Heirs Male of his Body, to take the Surname of Greene, pursuant to the Will of Thomas Greene Esquire, deceased." E. Fitzwalter. Ld. Abp. Cant. L. Bp. Landaff. L. Harrington, Sec. Their Lordships, or any Five of them; to meet on Monday next, at the usual Time and Place; and to adjourn as they please. Lewis et al. Leave for a Bill. Hodie 1a vice lecta est Billa, intituled, "An Act for vesting the Freehold and Leasehold Estates, late of Thomas Lewis of Soberton, Esquire, deceased, in Trustees, to be sold, for raising Money, to discharge his Debts and Legacies." State of National Debt delivered. The House being informed, "That Mr. Dawson, from the Exchequer, attended:"
"A State of the National Debt, provided or unprovided for by Parliament, as it stood on the 31st of December 1739, and 31st of December 1740; together with an Accompt of the Produce of the Sinking Fund in that Year; and to the Payment of what Debts, contracted before the 25th of December 1716, the said Fund hath been applied." Bourdillon et al. Nat. Bill. The Earl of Warwick reported from the Lords Committees to whom the Bill, intituled, "An Act for naturalizing of Gedeon Bourdillon and John David Billon," was committed: "That they had examined the Allegations thereof, which they found to be true; and that the Committee had gone through the Bill, and made several Amendments thereunto." Sir E. Bellew against McCartan. Upon reading the Petition and Appeal of Sir Edward Bellew Baronet, of the Kingdom of Ireland; complaining of a Decree of the Court of Exchequer in that Kingdom, of the 28th of January last, made in a Cause wherein the Appellant was Plaintiff, and Philemon M'Cartan and Mary his Wife, Thomas Tennison, the Reverend Doctor Patrick Delany and Margaret his Wife, John Woods, John Forster, and Richard Bellew, were Defendants; and praying, "That the same may be reversed; and that the Appellant may have such Relief as to the House shall seem meet:"
It is Ordered, That the said Defendants may have a Copy of the said Appeal; and they are hereby required to put in their Answer or respective Answers thereunto, in Writing, on or before Friday the 13th Day of March next; and that Service of this Order on their Attornies in the said Court be deemed good Service. Parkhurst et al. Writ of Error. Judges to attend. Ordered, That the Judges do attend this House, at the Hearing of the Cause upon a Writ of Error, wherein John Parkhurst and others are Plaintiffs, and Joseph Smith is Defendant. E. Ross against Worsop et al. The House being moved, "That a Day may be appointed, for hearing the Cause wherein Richard Earl of Ross is Appellant, and Elizabeth Worsop and others are Respondents:"
It is Ordered, That this House will hear the said Cause, by Counsel, at the Bar, the First vacant Day for Causes after those already appointed. Ordered, That the Committee to whom the Bill, intituled, "An Act for making a Chapel, lately built by John Coppin Esquire, in the Parish of Cadington, in the County of Hertford, a perpetual Cure and Benefice; and for other Purposes therein mentioned," stands committed, be revived; and meet on Tuesday next. The House being moved, "That an humble Address be presented to His Majesty, most humbly to advise and beseech His Majesty, that He will be most graciously pleased to remove the Right Honourable Sir Robert Walpole, Knight of the most Noble Order of the Garter, First Commissioner of His Majesty's Treasury, and Chancellor of the Exchequer, and One of His Majesty's most Honourable Privy Council, from His Majesty's Presence and Councils for ever:"
"1st, Because we are persuaded that a sole, or even a First, Minister is an Officer unknown to the Law of Britain, inconsistent with the Constitution of this Country, and destructive of Liberty in any Government whatsoever. And it plainly appearing to us that Sir Robert Walpole has for many Years acted as such, by taking upon himself the chief, if not the sole, Direction of Affairs, in the different Branches of the Administration; we could not but esteem it to be our indispensable Duty, to offer our most humble Advice to His Majesty, for the Removal of a Minister so dangerous to the King and the Kingdom. "2dly, Because we think it appeared in the Debate, that, in many Instances of infinite Consequence to the Interest of the Public, he has grossly abused the exorbitant Power which he illegally possessed himself of, particularly in the Management of the public Treasure: And this we conceive must plainly appear to every impartial Person, who recollects that, for these Twenty Years past, this Kingdom has paid the largest Taxes that ever were imposed upon it in Time of Peace; and yet, that the Public Debts remain much as they stood at the Time when this Gentleman first entered upon the Management of the Treasury; and that the Civil Lift also, the largest that was ever granted to the Crown, is (as we have the strongest Reasons to believe) considerably in Debt at this Time. "3dly, Because, we conceive, it was plainly proved in former Debates, that the Army, so greatly expenfive to this Kingdom, and which only was granted by Parliament for the Defence of it, had been managed, both as to Rewards and Punishments, in such Manner as to make it of no Military Use; but, on the contrary, to render it subservient, as we apprehend, to the very worst of Purposes, the influencing Elections without Doors, and Votes within. 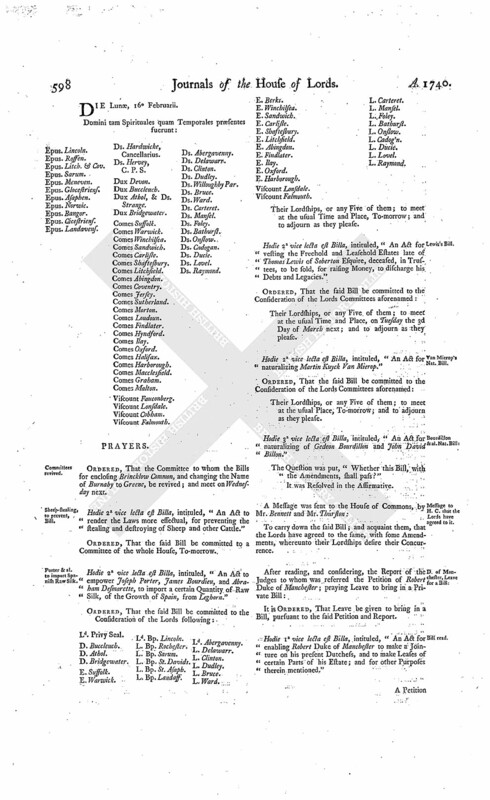 "4thly, Because we are persuaded, that the vast Sums of Money granted on different Heads for Sea Service cannot possibly have been faithfully applied; there having been as much Money granted by Parliament, in the last Six or Seven Years, upon the several Heads applicable to the repairing and re-building our Ships, as would have been sufficient to build the whole Fleet of Brittain, from the Keels of the Ships, and have put them thoroughly equipt to Sea: And yet it is most notoriously true, that, since this War began, a very great Number of the Ships have appeared to be in the worst Condition for Sea Service that ever they were known to be in the Memory of Man, and many of them scarcely fit for Spithead Expeditions; Ships having failed out of the River, destined as was pretended, for Foreign Service, that have with Difficulty been able to swim into the Docks of Portsmouth or Plymouth for further Repairs. "5thly, Because we apprehend, that, by the Conduct of Sir Robert Walpole in relation to Foreign Affairs, during the Course of his Administration, the Balance of Power in Europe has been destroyed; the House of Bourbon has been aggrandized in many Instances, particularly by the Addition of Lorain; the House of Austria has been depressed, by the Loss of Part of the Dutchy of Milan, and the whole Kingdoms of Naples and Sicily: And if such a Change in the System of Europe, occasioned by the Misconduct of any Minister whatsoever, would be criminal; we cannot think it the less so, in One who joined in the Prosecution of the Authors of the Treaty of Utrecht, upon the particular Charge of having reduced the House of Austria too low, and left the House of Bourbon too powerful. "6thly, Because it is a Fact not to be contradicted, That the Spaniards were permitted quietly to possess themselves of the Land belonging to our most important Fortress of Gibraltar, which this Kingdom was in Possession of, by virtue of the Treaty of Utrecht, till the last Siege of that Place; by which Permission, Fortifications were erected, and Batteries raised upon the said Ground, by the Spaniards; whereby the Use of the advantageous Bay of Gibraltar is lost to England, and our Ships ever since forced to anchor both inconveniently and dangerously under the Walls of the Town: And what naturally raises the strongest Suspicions in us of this unwarrantable Proceeding is, that a British Admiral soon after was at Cadiz, with a powerful Squadron of Ships of the Line, at the Time the Spaniards thus unjustly broke their Treaty; and that Admiral quietly and undisturbed left them in Possession of that Ground, and convoyed their Troops to take Possession of the Dominions of Tuscany. "7thly, Because the Papers upon our Table, delivered to the House from the Commissioners of the Customs, do plainly prove, that Sir Robert Walpole, by publickly conniving for many Years at the Trade carried on with this Nation from the Port of Dunkirk, has given up the 9th Article of the Treaty of Utrecht; which we cannot but look upon as a high Misdemeanor; and the greater Crime in him, that no Man whatsoever declared himself with more passionate Zeal than he did against the Authors of the Treaty of Utrecht, for having favoured France in most of the Articles of that Treaty; in Consequence of which Behaviour, it became peculiarly his Duty to preserve inviolably those Articles in it, which were incontestably stipulated for the Interest of this Crown and Nation. Resolution, that an Attempt to inflict a Punishment on any Person unheard, is contrary to natural Justice. &c.
Then it was moved; "To resolve, that any Attempt to inflict any Kind of Punishment on any Person, without allowing him an Opportunity to make his Defence, or without Proof of any Crime or Misdemeanor committed by him, is contrary to natural Justice, the fundamental Laws of this Realm, and the ancient established Usage of Parliament, and is a high Infringement of the Liberties of the Subject." The previous Question was put, "Whether that Question shall be now put?" Protest against putting the Question. "Because we think this Question ought not to have been put at this Time; for, though the Proposition contained in it is undoubtedly true in itself, yet we apprehend it to be no wife applicable to the Point, which had been so long debated the same Day; for we conceive that public Utility may render it necessary that a Person should be removed from an Office; and yet that Removal cannot be deemed a Punishment; for Instance, in the Cafe of Incapacity. Surely then, wilful Neglects, Breach of Duty, and evident Malversation, in an Office, may justly require this Great Council of State to present an humble Address to His Majesty, for the Removal of any Person guilty of such Crimes, in order to prevent public Detriment; and we cannot apprehend that the Motion, which occasioned the former Debate, was by any Means void of Proofs, since the Treaties and Papers referred to (being as Records in the Possession of the House) and the Notoriety of many Facts alleged were, in our Opinion, equal to a Cloud of Witnesses. 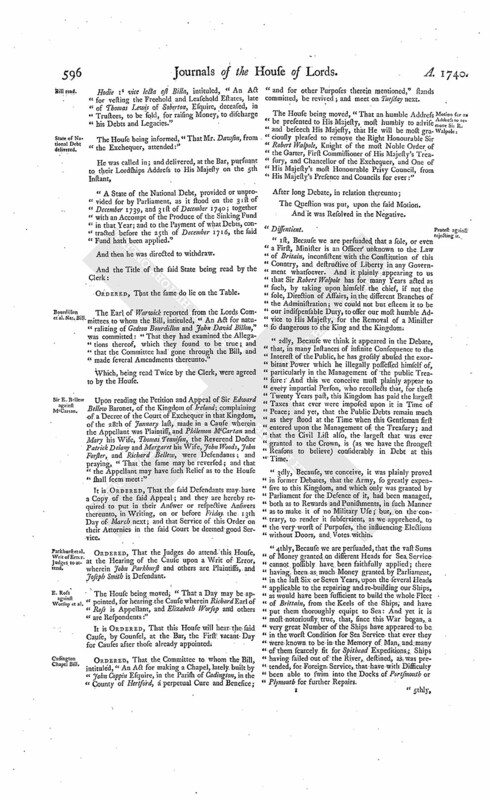 For these Reasons, although we agree to the Matter contained in the Question, and, acting in our Judicial Capacity, would never err from the Rules laid down in it; yet we cannot but wish the Question had been laid aside, lest a wicked Minister hereafter should think himself secure in his Office, if he cannot be brought personally to answer at the Bar of this House, and Witnesses viva voce cannot be produced against him. Then the main Question was put. And it was Resolved in the Affirmative. Dominus Cancellarius declaravit præsens Parliamentum continuandum esse usque ad et in diem Lunæ, decimum sextum diem instantis Februarii, hora undecima Auroræ, Dominis sic decernentibus. Ordered, That the Committee to whom the Bills for enclosing Brincklow Common, and changing the Name of Burnaby to Greene, be revived; and meet on Wednesday next. Hodie 2a vice lecta est Billa, intituled, "An Act to render the Laws more effectual, for preventing the stealing and destroying of Sheep and other Cattle." Porter & al. to import Spanish Raw Silk. 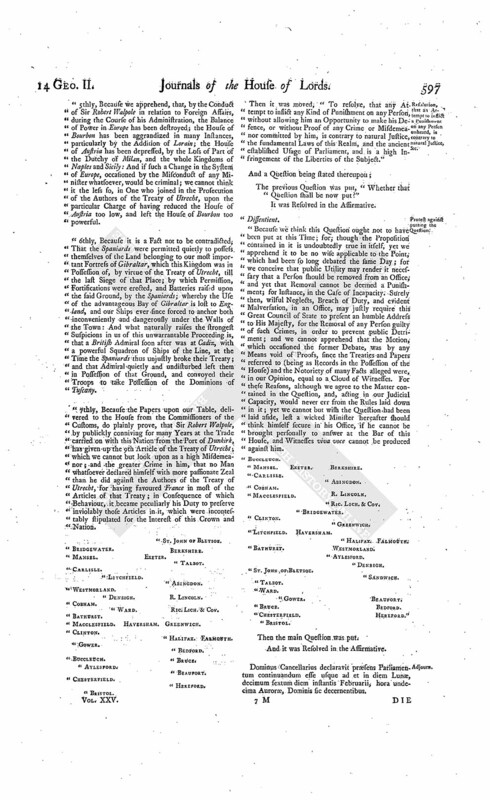 Hodie 2a vice lecta est Billa, intituled, "An Act to empower Joseph Porter, James Bourdieu, and Abraham Desmarette, to import a certain Quantity of Raw Silk, of the Growth of Spain, from Leghorn." Viscount Falmouth. Ld. Bp. Lincoln. L. Bp. Landaff. Ld. Abergavenny. Hodie 2a vice lecta est Billa, intituled, "An Act for vesting the Freehold and Leasehold Estates late of Thomas Lewis of Soberton Esquire, deceased, in Trustees, to be sold, for raising Money, to discharge his Debts and Legacies." Their Lordships, or any Five of them; to meet at the usual Time and Place, on Tuesday the 3d Day of March next; and to adjourn as they please. Hodie 2a vice lecta est Billa, intituled, "An Act for naturalizing Martin Kuyck Van Mierop." Their Lordships, or any Five of them; to meet at the usual Place, To-morrow; and to adjourn as they please. Bourdillon & al. Nat. Bill. Hodie 3a vice lecta est Billa, intituled, "An Act for naturalizing of Gedeon Bourdillon and John David Billon." To carry down the said Bill; and acquaint them, that the Lords have agreed to the same, with some Amendments, whereunto their Lordships desire their Concurrence. Hodie 1a vice lecta est Billa, intituled, "An Act for enabling Robert Duke of Manchester to make a Jointure on his present Dutchess, and to make Leases of certain Parts of his Estate; and for other Purposes therein mentioned." Mackattie to withdraw his Appeal. A Petition of Patrick Mackattie, was presented, and read; setting forth, "That he is advised to withdraw his Appeal, to which John Frigg and James Frazer are Respondents, on Payment of such Costs as to this House shall seem meet;" and praying, "That he may have such Liberty." And Counsel on both Sides attending (the Cause being appointed for Hearing this Day); they were called in, and heard. Ordered, That the Petitioner have Leave to withdraw his said Appeal, as desired; upon Payment of Twenty Pounds to the said Respondents, for their Costs in respect thereof. Dominus Cancellarius declaravit præsens Parliamentum continuandum esse usque ad & in diem Martis, decimum septimum diem instantis Februarii, hora undecima Auroræ, Dominis sic decernentibus. Hodie 1a vice lecta est Billa, intituled, "An Act for vesting Part of the settled Estate of Thomas Edmunds Esquire in Trustees, to be sold, for raising Money, to discharge the Debts of himself and his late Father deceased; and for settling another Estate, of greater Value, in Lieu thereof." Hodie 2a vice lecta est Billa, intituled, "An Act for enabling Robert now Duke of Manchester to make a Jointure on his present Dutchess, and to make Leases of certain Parts of his Estate; and for other Purposes therein mentioned." Viscount Torrington. Ld. Bp. Rochester. 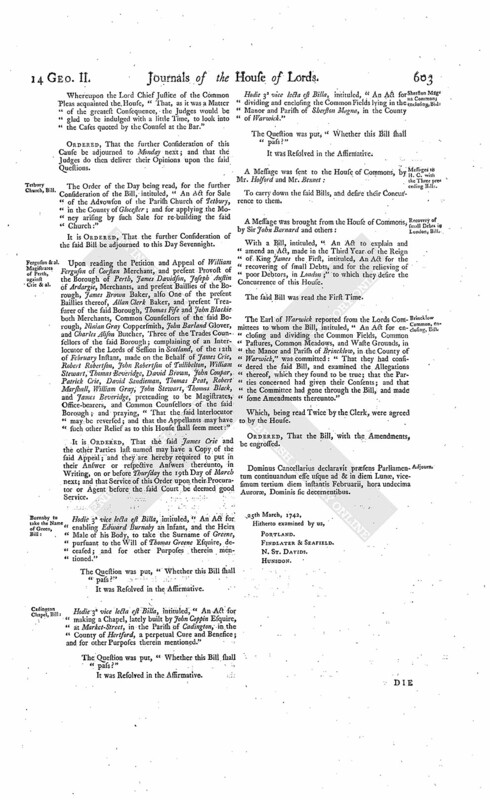 Importation of Victual from Ireland to Scotland, Bill. With a Bill, intituled, "An Act for licensing the Importation of Victual from Ireland, and other Parts beyond the Seas, into Scotland, in Time of Dearth and Scarcity;" to which they desire the Concurrence of this House. 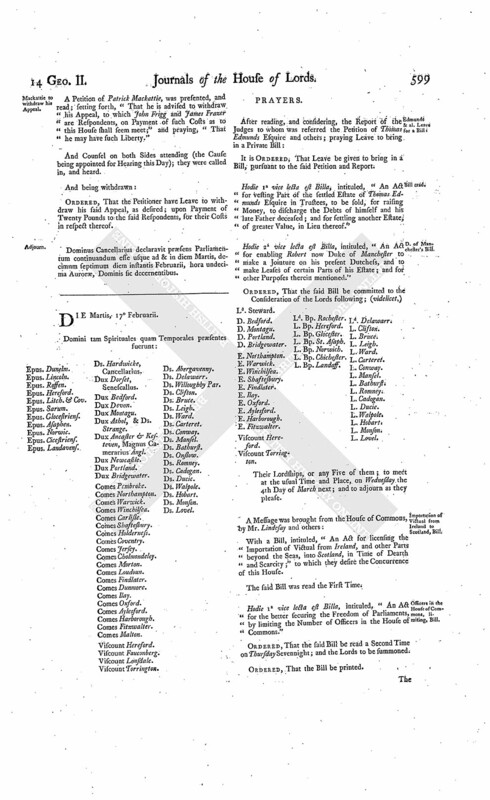 Officers in the House of Commons, limiting, Bill. Hodie 1a vice lecta est Billa, intituled, "An Act for the better securing the Freedom of Parliaments, by limiting the Number of Officers in the House of Commons." Ordered, That the said Bill be read a Second Time on Thursday Sevennight; and the Lords to be summoned. Ordered, That the Bill be printed. Porter & al. to import Spanish Raw Silk, Bill. The Lord Bishop of St. Asaph reported from the Lords Committees to whom the Bill, intituled, "An Act to empower Joseph Porter, James Bourdieu, and Abraham Desmarette, to import a certain Quantity of Raw Silk, of the Growth of Spain, from Leghorn," was committed: "That they had considered the said Bill, and examined the Allegations thereof, which they found to be true; and that the Committee had gone through the Bill, and directed him to report the same to the House, without any Amendment." 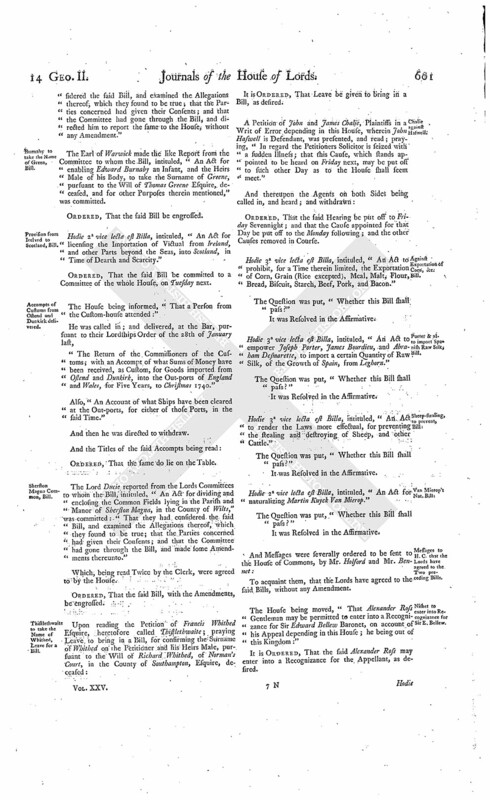 The Lord Bishop of St. Asaph made the like Report from the Committee to whom the Bill, intituled, "An Act for making a Chapel, lately built by John Coppin Esquire, at Market-Street, in the Parish of Cadington, in the County of Hertford, a perpetual Cure and Benefice, and for other Purposes therein mentioned," was committed. The Earl of Warwick made the like Report from the Lords Committees to whom the Bill, intituled, "An Act for naturalizing Martin Kuyck Van Mierop," was committed. The House (according to Order) was adjourned during Pleasure, and put into a Committee upon the Bill, intituled, "An Act to render the Laws more effectual, for preventing the stealing and destroying of Sheep and other Cattle." 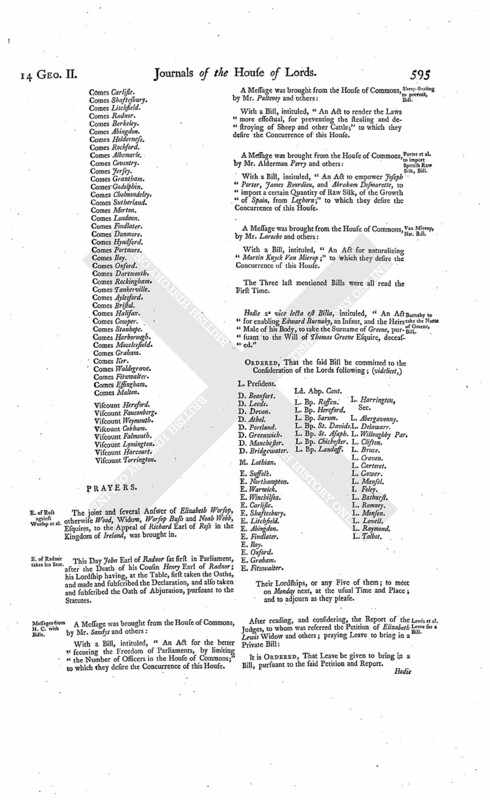 The Order being read, for the House to be in a Committee upon the Bill, intituled, "An Act to amend the Law concerning Common Recoveries; and to explain and amend an Act made in the Twenty-ninth Year of the Reign of King Charles the Second, intituled, "An Act for Prevention of Frauds and Perjuries," so far as the same relates to Estates pur auter Vie." Ordered, That the House be put into a Committee thereupon on this Day Sevennight; the Lords to be summoned; and the Judges then to attend. To prevent Exportation of Corn, Bill. The House (according to Order) was adjourned during Pleasure, and put into a Committee upon the Bill, intituled, "An Act to prohibit, for a Time therein limited, the Exportation of Corn, Grain (Rice excepted), Meal, Malt, Flour, Bread, Biscuit, Starch, Beef, Pork, and Bacon." 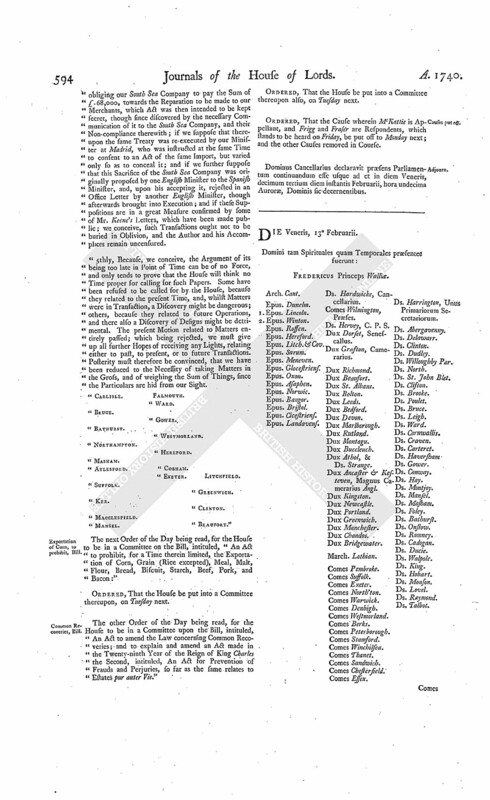 Ordered, That the Committee to whom the Bill, intituled, "An Act for vesting of certain Manors, Lands, and Tenements, of William Hudleston Esquire, in Trustees, to be sold, for Payment of his Debts," stands committed, which is appointed to meet on Saturday next, be put off to Thursday Sevennight. Dominus Cancellarius declaravit præsens Parliamentum continuandum esse usque ad & in diem Mercurii, decimum octavum diem instantis Februarii, hora undecima Auroræ, Dominis sic decernentibus. The Earl of Shaftesbury reported from the Lords Committees to whom the Bill, intituled, "An Act for confirming and establishing Articles of Agreement, and an Award, for dividing and enclosing certain Common Fields, and a Common called Chawton Common, in the Parish of Chawton, in the County of Southampton," was committed: "That they had con sidered the said Bill, and examined the Allegations thereof, which they found to be true; that the Parties concerned had given their Consents; and that the Committee had gone through the Bill, and directed him to report the same to the House, without any Amendment." Burnaby to take the Name of Green, Bill. The Earl of Warwick made the like Report from the Committee to whom the Bill, intituled, "An Act for enabling Edward Burnaby an Infant, and the Heirs Male of his Body, to take the Surname of Greene, pursuant to the Will of Thomas Greene Esquire, deceased, and for other Purposes therein mentioned," was committed. Provision from Ireland to Scotland, Bill. Hodie 2a vice lecta est Billa, intituled, "An Act for licensing the Importation of Victual from Ireland, and other Parts beyond the Seas, into Scotland, in Time of Dearth and Scarcity." Ordered, That the said Bill be committed to a Committee of the whole House, on Tuesday next. Accompts of Customs from Ostend and Dunkirk delivered. The House being informed, "That a Person from the Custom-house attended:"
"The Return of the Commissioners of the Customs; with an Accompt of what Sums of Money have been received, as Custom, for Goods imported from Ostend and Dunkirk, into the Out-ports of England and Wales, for Five Years, to Christmas 1740." Also, "An Account of what Ships have been cleared at the Out-ports, for either of those Ports, in the said Time." The Lord Ducie reported from the Lords Committees to whom the Bill, intituled, "An Act for dividing and enclosing the Common Fields lying in the Parish and Manor of Sherston Magna, in the County of Wilts," was committed: "That they had considered the said Bill, and examined the Allegations thereof, which they found to be true; that the Parties concerned had given their Consents; and that the Committee had gone through the Bill, and made some Amendments thereunto." Thistlethwaite to take the Name of Whithed, Leave for a Bill. A Petition of John and James Chalie, Plaintiffs in a Writ of Error depending in this House, wherein John Haswell is Defendant, was presented, and read; praying, "In regard the Petitioners Solicitor is seized with a sudden Illness; that this Cause, which stands appointed to be heard on Friday next, may be put off to such other Day as to the House shall seem meet." Ordered, That the said Hearing be put off to Friday Sevennight; and that the Cause appointed for that Day be put off to the Monday following; and the other Causes removed in Course. Against Exportation of Corn, &c. Bill. Hodie 3a vice lecta est Billa, intituled, "An Act to prohibit, for a Time therein limited, the Exportation of Corn, Grain (Rice excepted), Meal, Malt, Flour, Bread, Biscuit, Starch, Beef, Pork, and Bacon." Hodie 3a vice lecta est Billa, intituled, "An Act to empower Joseph Porter, James Bourdieu, and Abraham Desmarette, to import a certain Quantity of Raw Silk, of the Growth of Spain, from Leghorn." Hodie 3a vice lecta est Billa, intituled, "An Act to render the Laws more effectual, for preventing the stealing and destroying of Sheep, and other Cattle." Nisbet to enter into Recognizance for Sir E. Bellew. The House being moved, "That Alexander Ross Gentleman may be permitted to enter into a Recognizance for Sir Edward Bellew Baronet, on account of his Appeal depending in this House; he being out of this Kingdom:"
It is Ordered, That the said Alexander Ross may enter into a Recognizance for the Appellant, as desired. Hodie 2a vice lecta est Billa, intituled, "An Act for vesting Part of the settled Estate of Thomas Edmunds Esquire in Trustees, to be sold, for raising Money, to discharge the Debts of himself and his late Father, deceased; and for settling another Estate, of greater Value, in Lieu thereof." Viscount Falmouth. Ld. Bp. Rochester. Their Lordships, or any Five of them; to meet at the usual Time and Place, on Thursday the 5th Day of March next; and to adjourn as they please. Parkhurst & al. against Smith, in Error. It is Ordered, That the further Hearing of this Cause be adjourned till To-morrow; and that the Counsel be called in precisely at One o'Clock. Dominus Cancellarius declaravit præsens Parliamentum continuandum esse usque ad & in diem Jovis, decimum nonum diem instantis Februarii, hora undecima Auroræ, Dominis sic decernentibus. Ludewig, Leave for a Nat. Bill. "1. Whether the Remainder, limited to the First Son of Euseby Dormer, was good in its original Creation, or not? "2. If good, whether it is well barred by the Fine levied by Mr. Justice Dormer and his Son Fleetwood Dormer, and the Recovery suffered by the said Fleetwood Dormer?" Whereupon the Lord Chief Justice of the Common Pleas acquainted the House, "That, as it was a Matter of the greatest Consequence, the Judges would be glad to be indulged with a little Time, to look into the Cases quoted by the Counsel at the Bar." Ordered, That the further Consideration of this Cause be adjourned to Monday next; and that the Judges do then deliver their Opinions upon the said Questions. 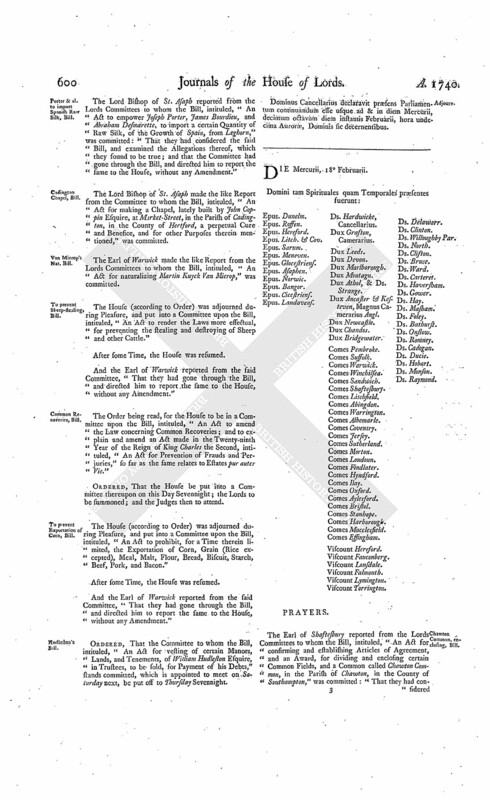 The Order of the Day being read, for the further Consideration of the Bill, intituled, "An Act for Sale of the Advowson of the Parish Church of Tetbury, in the County of Glocester; and for applying the Money arising by such Sale for re-building the said Church:"
It is Ordered, That the further Consideration of the said Bill be adjourned to this Day Sevennight. Ferguson & al. Magistrates of Perth, against Crie & al. 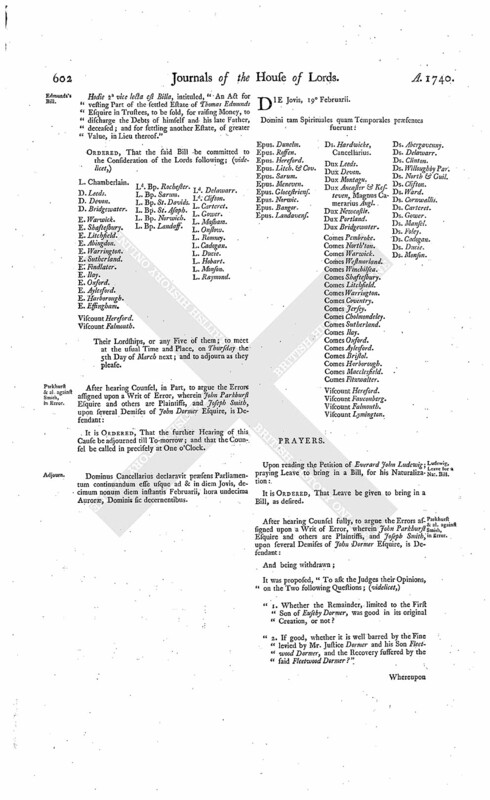 Upon reading the Petition and Appeal of William Ferguson of Corstan Merchant, and present Provost of the Borough of Perth, James Davidson, Joseph Austin of Ardargie, Merchants, and present Baillies of the Borough, James Brown Baker, also One of the present Baillies thereof, Allan Clerk Baker, and present Treasurer of the said Borough, Thomas Fife and John Blackie both Merchants, Common Counsellors of the said Borough, Ninian Gray Coppersmith, John Barland Glover, and Charles Alison Butcher, Three of the Trades Counsellors of the said Borough; complaining of an Interlocutor of the Lords of Session in Scotland, of the 12th of February Instant, made on the Behalf of James Crie, Robert Robertson, John Robertson of Tullibelton, William Stewart, Thomas Beveridge, David Brown, John Coupar, Patrick Crie, David Sandieman, Thomas Peat, Robert Marshall, William Gray, John Stewart, Thomas Black, and James Beveridge, pretending to be Magistrates, Office-bearers, and Common Counsellors of the said Borough; and praying, "That the said Interlocutor may be reversed; and that the Appellants may have such other Relief as to this House shall seem meet:"
It is Ordered, That the said James Crie and the other Parties last named may have a Copy of the said Appeal; and they are hereby required to put in their Answer or respective Answers thereunto, in Writing, on or before Thursday the 19th Day of March next; and that Service of this Order upon their Procurator or Agent before the said Court be deemed good Service. Hodie 3a vice lecta est Billa, intituled, "An Act for enabling Edward Burnaby an Infant, and the Heirs Male of his Body, to take the Surname of Greene, pursuant to the Will of Thomas Greene Esquire, deceased; and for other Purposes therein mentioned." Hodie 3a vice lecta est Billa, intituled, "An Act for making a Chapel, lately built by John Coppin Esquire, at Market-Street, in the Parish of Cadington, in the County of Hertford, a perpetual Cure and Benefice; and for other Purposes therein mentioned." Hodie 3a vice lecta est Billa, intituled, "An Act for dividing and enclosing the Common Fields lying in the Manor and Parish of Sherston Magna, in the County of Warwick." With a Bill, intituled, "An Act to explain and amend an Act, made in the Third Year of the Reign of King James the First, intituled, An Act for the recovering of small Debts, and for the relieving of poor Debtors, in London;" to which they desire the Concurrence of this House. The Earl of Warwick reported from the Lords Committees to whom the Bill, intituled, "An Act for enclosing and dividing the Common Fields, Common Pastures, Common Meadows, and Waste Grounds, in the Manor and Parish of Brincklow, in the County of Warwick," was committed: "That they had considered the said Bill, and examined the Allegations thereof, which they found to be true; that the Parties concerned had given their Consents; and that the Committee had gone through the Bill, and made some Amendments thereunto." Dominus Cancellarius declaravit præsens Parliamentum continuandum esse usque ad & in diem Lunæ, vicesimum tertium diem instantis Februarii, hora undecima Auroræ, Dominis sic decernentibus.